Whoever speaks about security usually means stability. But stability is just one aspect of security. Protection against dismantling is surely just as important, but is normally forgotten about. That is why LEGI developed bolting from the inside, the LEGI R pur concept. 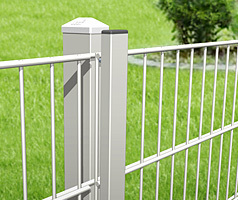 Dismantling the fence from the outside is made much more difficult for the intruder and the security is significantly increased for an owner of a real LEGI. Through the provision of LEGI R+ATK has the LEGI R system for TÜV and DEKRA-certified stability and security against destruction. 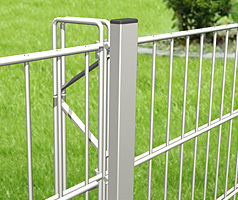 It is the best child-proof lock for your garden. Overlapping grilles bolted with a clamping pipe from the inside. 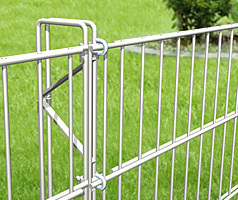 The clamping pipe covers the bolting to the post from the outside, whose lattice-like design provides for a tremendous load-carrying capacity. Overlapping grilles bolted from the inside with U-bolts or hook bolts. 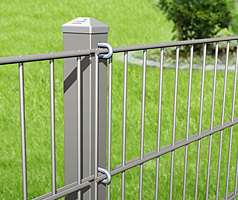 The overlapping grilles are mounted in the U-bolts or hook bolts and are quickly and securely bolted from the property side. The clamping pipe is tightened on the property side with stud bolts and provides for a stable connection.